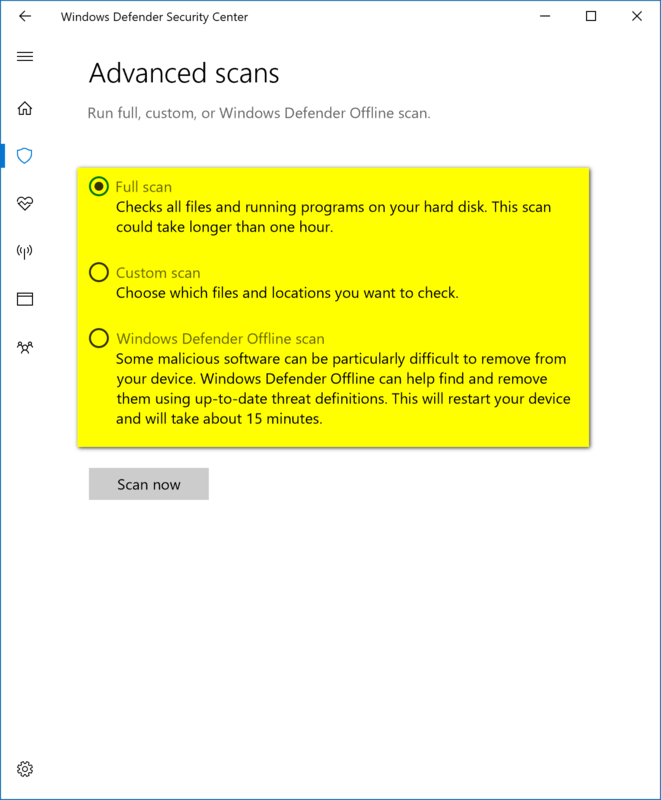 Windows 10 gives people a few options to scan with Windows Defender. When you start using Windows 10, you’d be forgiven for wondering where the Windows Defender is and if it is even working. But in truth, all versions of Windows 10 do come with a built-in anti-virus just as it did with all versions of Windows 8. That anti-virus is still called Windows Defender, and it’s almost the program as you knew before. The main difference is that you now have several ways to get access to running full scans, custom scans, offline scans, quick scans, and even scanning individual folders or drives without having to run a scan for anything else. 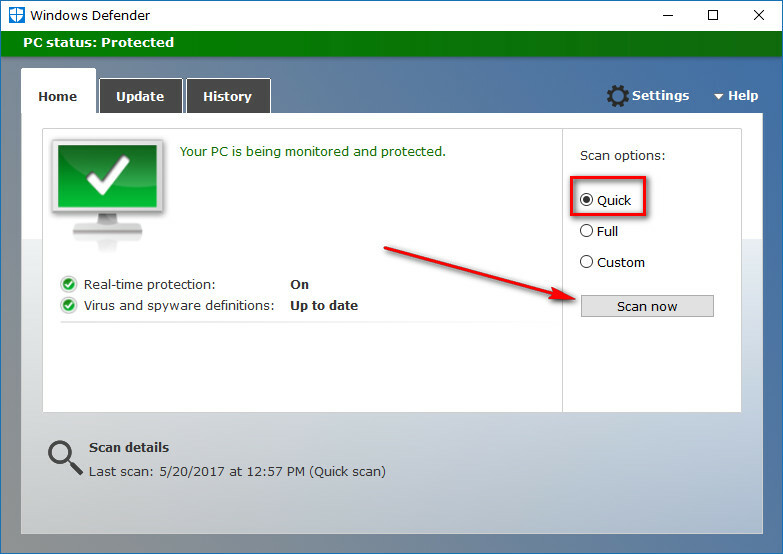 While our modern-day scan operating systems do a great job of picking up malware and doing it quietly in the background without using many resources, there is still one downside that hasn’t changed much: the scan can take a long time to finish–even for the “Quick scan” option from the Windows Defender user interface. That’s where scanning an individual folder or drive comes into play. Often a folder scan can be completed in just a few seconds, instead of the thirty or so minutes you would have had to wait if you scanned the entire computer with the quick scan. That’s the main reason for learning how to use Windows Defender more efficiently in the guide below. One of the common misconceptions out there is that Mac’s don’t get viruses. That opinion that somehow managed to flow right around the world was hurting Microsoft, and they have counterintuitively managed to come up with a decent solution: include anti-virus in the Windows operating system so Windows users also think their computers don’t need protection. In truth, both Mac and Windows operating systems running on any computer are always going to be susceptible to viruses, but the Windows Defender program in Windows 10 is doing a great job of making people feel as secure as possible. 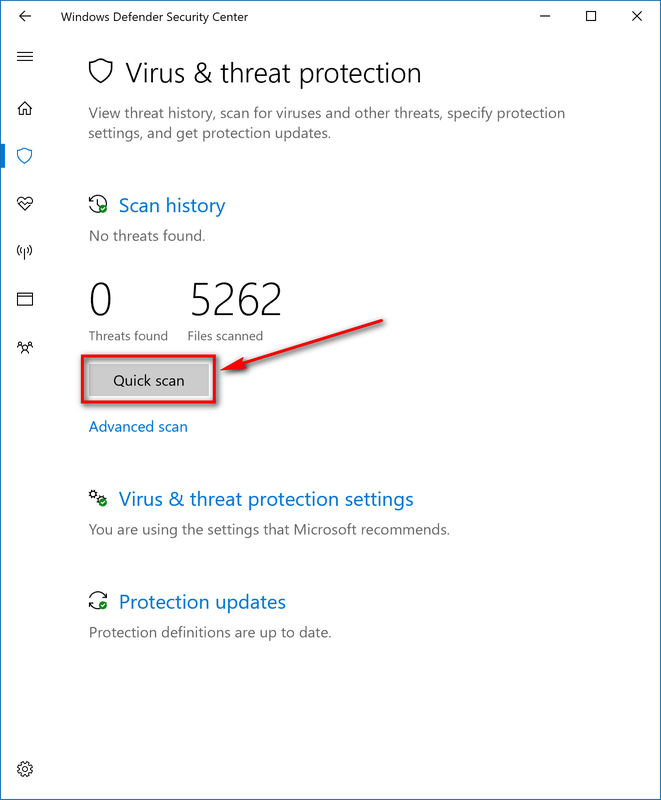 Just like most other anti-malware programs, the Windows Defender runs by itself in the background, so there is no need for you to manually be scanning files very often unless you want to make sure or double check something. Most computers these days have hardware good enough so that when Windows Defender is running in the background, you won’t even notice it. Microsoft is also to be thanked for that because the current versions of Windows Defender use up a lot fewer resources in Windows than they used to which also helps in the silent system assessments taking place on your computer. 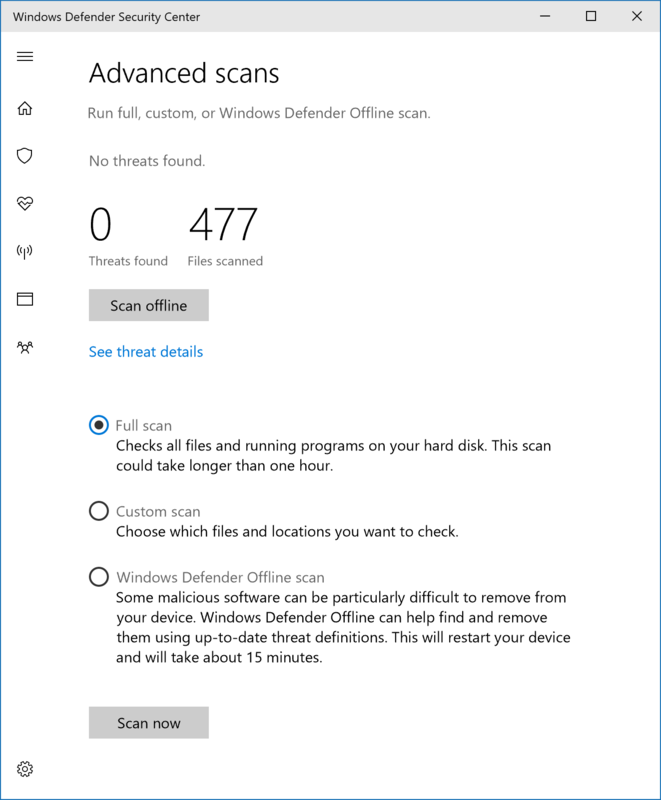 Similar to how it’s always been with Windows Update, though, these Windows Defender scans only take place periodically and not all of the time which means there could potentially be something suspicious in a file that your anti-malware protection hasn’t picked up on yet. Those are the times when you want to scan these files manually by doing the step above. If your results show that a threat is found, then you will probably want to click on the “See threat details” link given below the result so you can see further information regarding the threats. You’ll also see another button available if a threat is detected that says “Clean threats” that you can click if you just want to quarantine them right away. If you did have threats found, you would get them shown under the “Current threats” section. These are potential threats to your computer that require you to choose what you want to do with them. If you want to quarantine all threats that are found. The quarantine (or vault as it is called in other software) is like a jail for the threats that it has found. You’ll also notice an “Allowed threats” section. There are occasions when Windows Defender will detect something as a threat, but you know for sure that it is not a threat. Those are the cases that you want to allow the “threats” to still run around your operating system. If you accidentally didn’t quarantine a threat that you wish you did, then you should always run another scan and make sure it is quarantined after the next scan completes. These scans for folders or drives don’t take a long time to complete, so there’s no excuse for not doing another scan of the individual folder or drive. You also have access to many other options in the left pane. The screenshot below is the same user interface you see when you get access to the Windows Defender that is available from the system tray in the taskbar. Sometimes users can click the icon, and yet it doesn’t do anything. If you find yourself in a situation where you are clicking the mouse or touchpad on the Windows Defender logo, and it isn’t opening, then you need to right-click on it instead and then choose the “Open” option that becomes available. 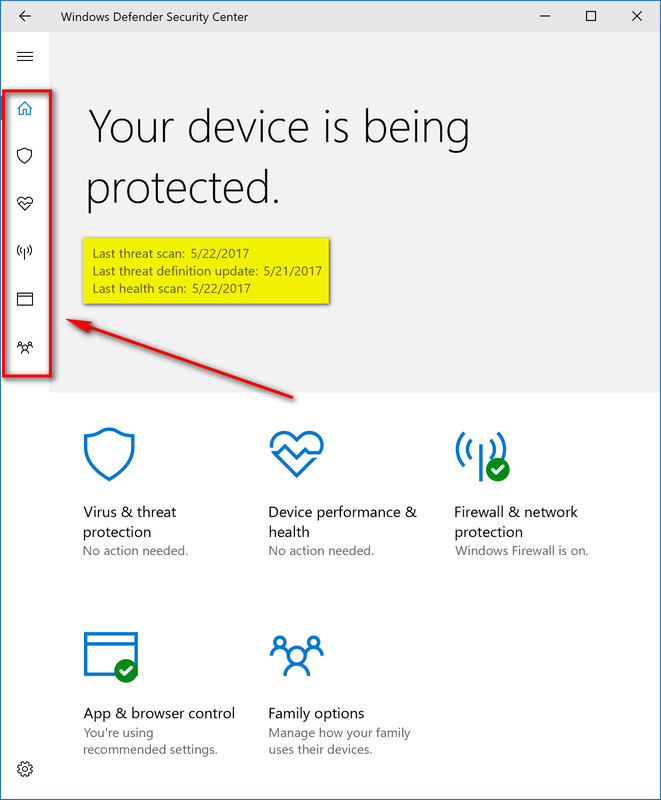 The first screen that you see let’s you know if Windows Defender is protecting your device or not (in other words, you are aware that it is on like it should be.) To get started with running scans, click on the shield icon in the left pane. It shows you the scan history from the “Virus and protection” section. 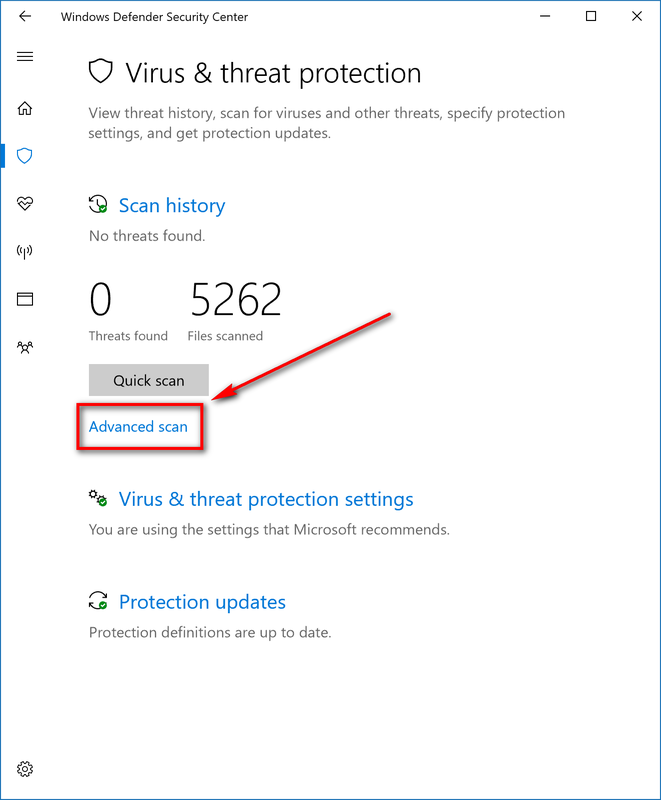 Beneath the results of the scans is a button for a “Quick scan” and a link available for an “Advanced scan.” Most people just choose to do the quick scan option when they manually run the Windows Defender anti-virus, but the advanced scan gives you quite a few additional options. Click on the “Advanced scan” link if you have more interest in doing a full scan of the computer, or want to do a custom scan or even an offline scan of the computer. The full scan takes the longest time from start to finish, and it’s pleasant if you ever have to sit through one. Most people run the quick scan, and if the problem is not resolved, then resort to having to wait around for the full scan to complete. A custom scan is useful if you know a particular place on the computer that is most likely to have the problem on it. For example, you might have downloaded something recently and know the malware that is causing your computer programs is in a particular area. The custom scan is also useful if you have a vague idea where it is and a relatively good idea of where it is not. If you can eliminate at least a few areas here, then it can save a significant amount of time in comparison to the full scan. 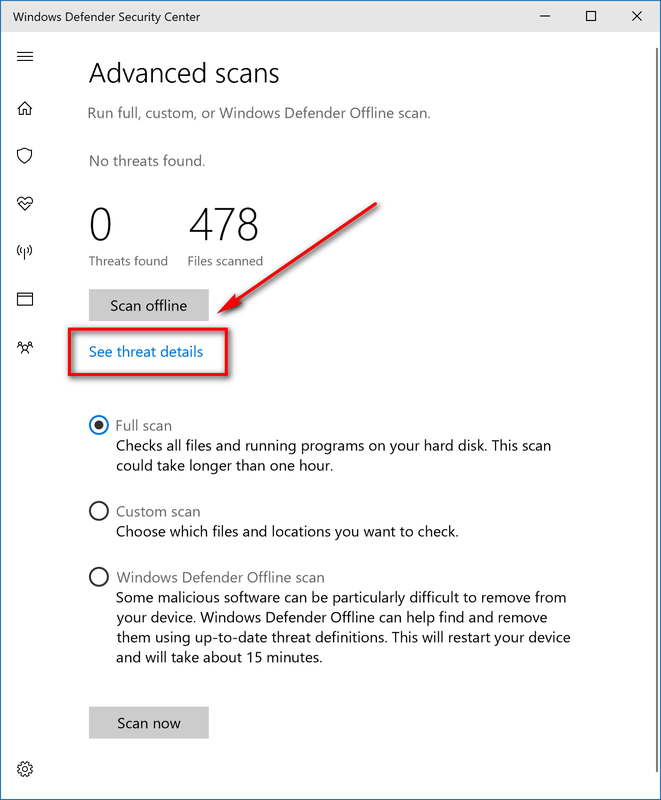 Lastly, everyone should get to know the offline scan option that Windows Defender has. Sadly, the offline option is not there, so it will automatically run the scan when you are sleeping. It’s more about having to do additional tasks that cannot be done when online, so to get to those places and remove the malware adequately, it needs to do the offline scan. 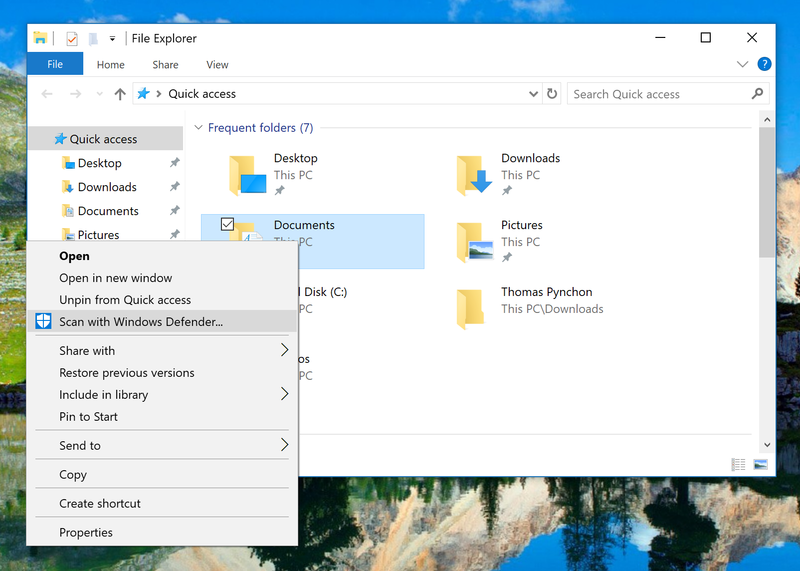 Microsoft has done a pretty good job of tucking away the usual Windows Defender user interface that the program has now had since Windows 8, but it is still around for you to use. In order to find it, you need to press the Windows logo key + R on your keyboards to open up the Run dialog box. Next, type %ProgramFiles%\Windows Defender\MSASCui.exe and click on the “OK” button. The Windows Defender user interface pictured below will now be on the computer’s screen. Here you have the same options to scan the computer. Look where it says the “Scan options” in the right side pane and then click on the “Quick” option whenever you want to do a quick scan of the computer. The scan begins as soon as you click on the “Scan now” button. If you wanted to do the custom scan instead of the full scan or the quick scan, then you also have the option to do that here as well. After you select the custom option, it gives you the chance to choose between scanning the C:// drive, D:// drive or the E:// drive depending on your needs. 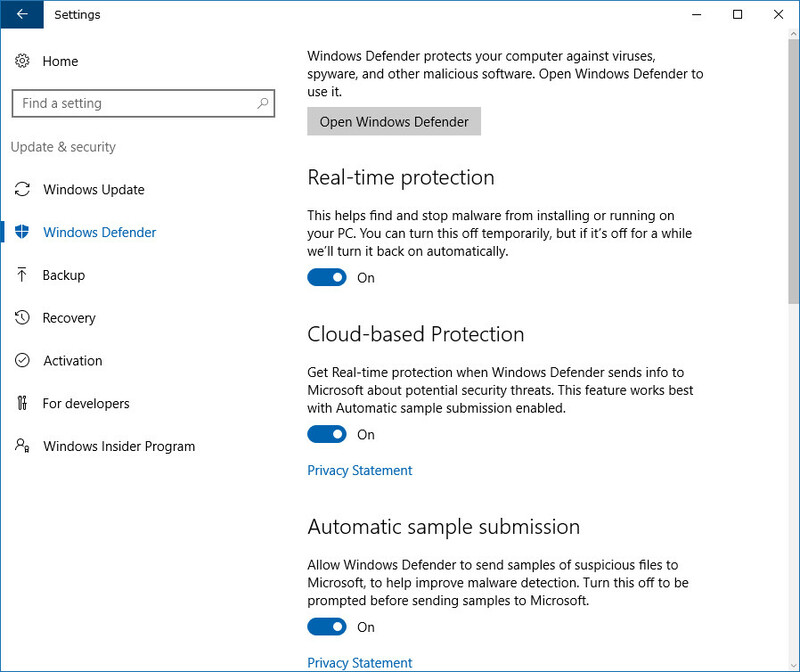 Microsoft has integrated the Windows Defender settings into the Settings app. 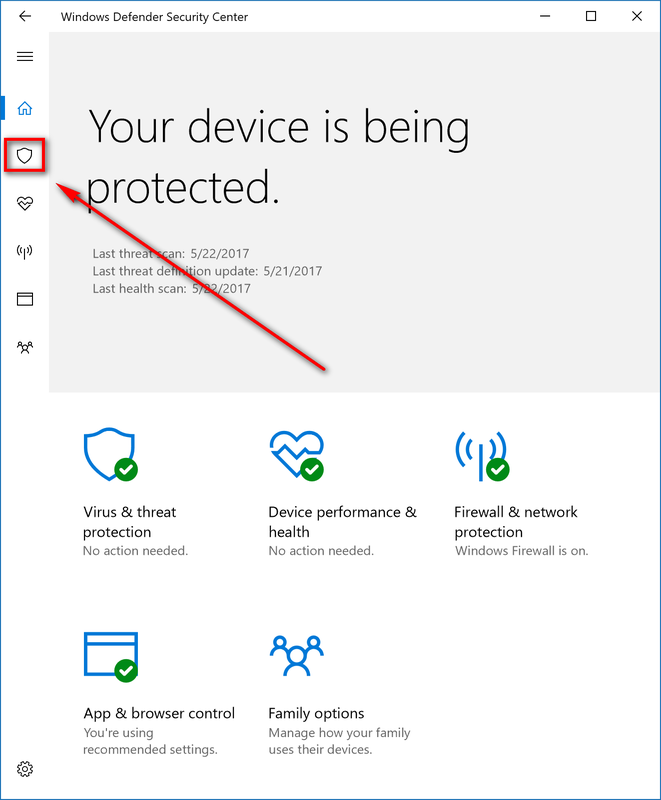 You can navigate to that location by using the Start menu > Settings app > Update and security > Windows Defender. Additionally, it’s available from the Windows Defender user interface that you have open already by clicking on the “Settings” link in the top right corner. If you want to have the Windows Defender program running in the background and doing automatic scans without you knowing anything, then you need to make sure you have the “Real-time protection” toggle switch turned on. It’s turned on by default, so if you haven’t changed anything from the Settings, you don’t need to worry. In an effort for Microsoft to get better at making PCs more secure by understanding malware as much as possible, they also have the Cloud-based protection, and automatic sample submission options turned on. Some people might not want Microsoft getting details about threats that are coming from their computers. If you are one of those people, then you can turn these off. There’s really no reason to turn these off; even if information is sent to Microsoft, it’s not going to reveal anything personal. Nonetheless, some people prefer privacy settings being set to their utmost maximum, so Microsoft has included the option to keep everyone happy. 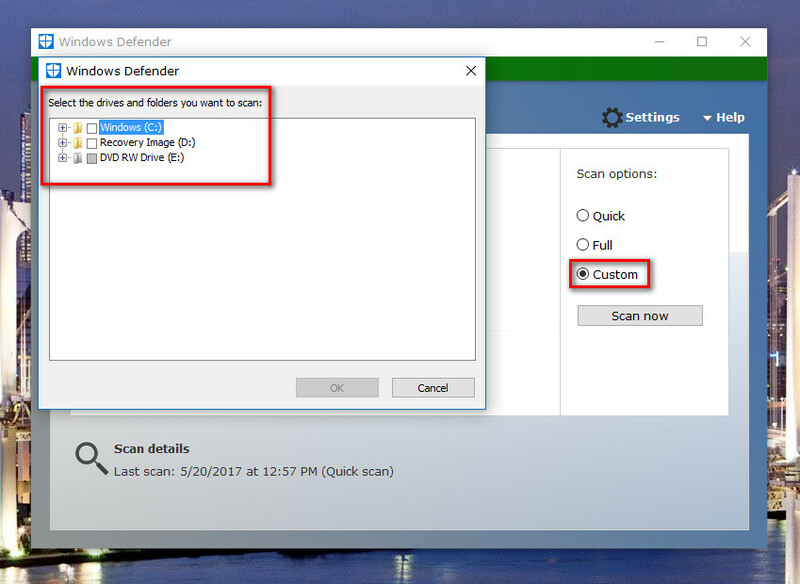 If you like the idea of a custom scan where Windows Defender only scans the areas of the computer that you want to be scanned, then you might be interested in using the “Exclusions” option from the Settings. Here you can set each scan to skip a particular area if you know it’s going to be a waste of time. Setting it from here will mean that each time the Windows Defend runs, it will automatically skip those places whereas if you run a custom scan, it is only skipping the areas of per your request for that one scan and will then scan the whole are the next scan unless you do the custom option again. It’s not a must that you use Windows Defender, and many tech enthusiasts have their preference as to what works best for their PCs. If you’re interested in what I run on my computer, it is nothing but the Windows Defender set on its default settings. I’ve tried most free anti-virus options over the years, and many of them were good. But none run scans as lightly as I find Windows Defender does. One potential cause for concern I have noticed, however, is that Windows Defender doesn’t pick up anywhere near as many potential threats as other antivirus software does. Whether that’s because the other programs are puffing up threats or Windows Defender isn’t as good at finding them is yet to be determined. What I am aware of, though, is that my browsing habits have hardly changed over the years and I’m yet to have an issue on my computer that Windows Defender couldn’t handle before it ever became a problem. 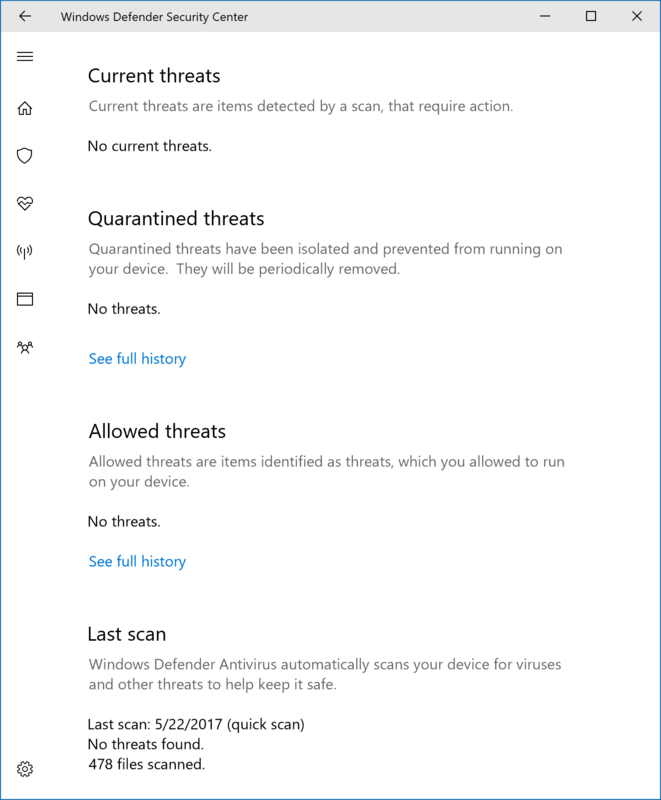 No virus has ever created a problem for me yet with Windows 10’s Windows Defender running. 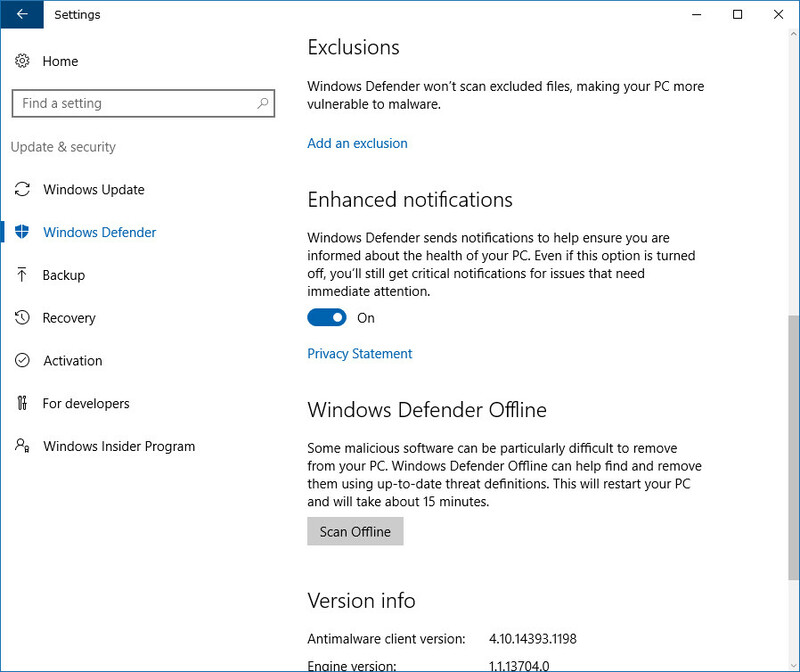 If you do choose to go down the path of running something else, the Windows Defender will detect you are using another anti-virus program and automatically disable itself from the computer. There is no way you can run Windows Defender and another anti-virus program like Avast or AVG at the same time—although that would make things difficult for malware if it were possible. One of the tools that does allow you to check the results of multiple programs at once is VirusTotal. It doesn’t let the programs run on your computer simultaneously, but it does instead utilize the VirusTotal website for the scans and give you the results from most of the big name reliable sources out there in existence. VirusTotal won’t run on your PC and protect it from threats, so it isn’t to be considered a replacement for Windows Defender, but it does allow you to scan individual files as you please and either before or after you download them onto your computer.